Beavertail is a national park, and open year round. 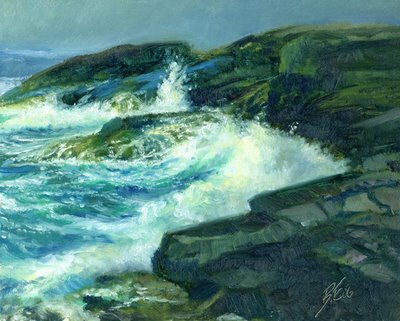 Since it was especially nice lately, and the surf was especially rough, I wanted to do some painting and did this little 8x10 in about 45 minutes. Man, I LOVE painting ocean-hitting-rocks. If Rhode Island is good for one thing, it's got a cool coastline(which is what makes up for the bureaucracy of tearing down old bridges). Expect alot of these kind of paintings here. In fact, I'm doing a fairly "epic" sea monster/fantasy painting and that will have lots of rocks with ocean, so this is getting me into the "place"(frame of mind) to do that(you see, fellow Fantasy and SF lovers, how it all ties together?). I'm a huge fan of Winslow Homer and he did some fantastic seascapes of the Maine coast. His critics told him "Don't paint seascapes, no one will like them" and yet what do we remember him most for? Like I said earlier, all these paintings are $100 apiece, just contact me if so inclined. But just comments are nice as well! So enjoy. I've been out there - very nice spot. And nice capture!